It's coming... Layla Cosmetics is bringing Holograhic polish back to the United States! Today I have Ultra Violet, a light purple holographic polish with linear holo!!! 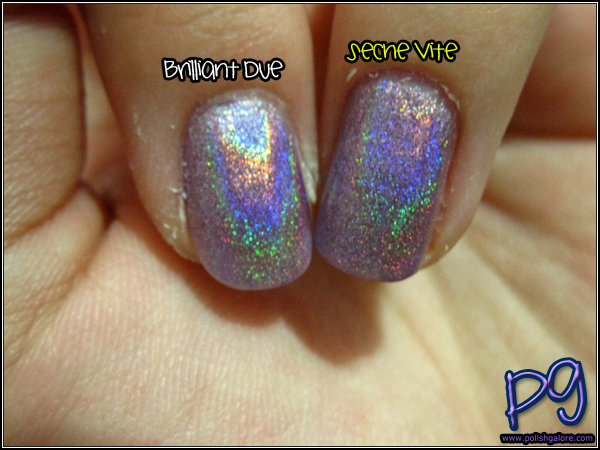 This is where you can see the full rainbow on the nail versus a scattered holo (like China Glaze Tronica). Now there are some downsides but we'll get to those much later. First off, Layla claims not to need a base or top coat with its polishes - they keep it simple. Instead, they provide a nail file with the holographic polish that has 2 sides. 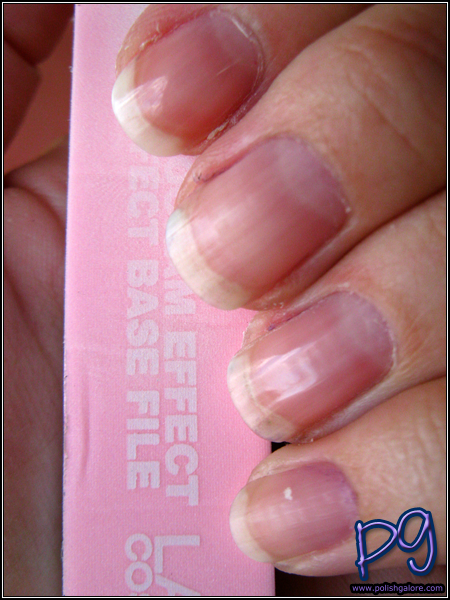 The pink side is to file the ridges down, the white side buffs your nails. 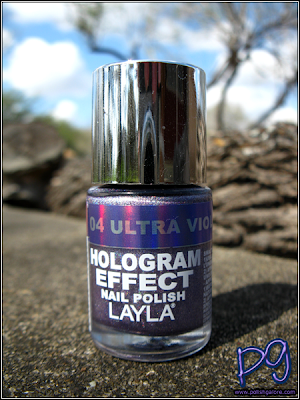 Then you have a smooth surface to apply your Hologram Effect polish on. I buffed my index and ring fingers but left my middle and pinkie finger unbuffed. Can you see the difference in the shine and amount of ridges on my nails? Next I applied 3 coats of polish to all my nails. Warning, lots of nail spam coming now! nom nom nom. Nail LOVE. This color is a lot like China Glaze Octa Gone Wild except this has way more holographic goodness in my opinion. Again, this is without a top coat. Next, I wanted to try some top coat. 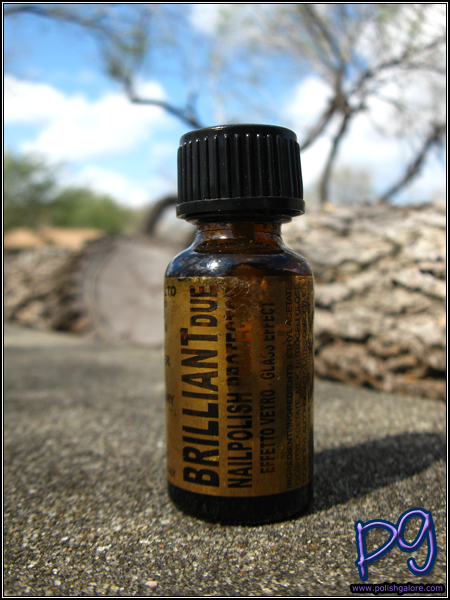 Layla makes a top coat called Brilliant Due Nail Polish Protector ($19 at Zappos for 0.33 fl oz). It has a bit of a "glass effect" that will prove useful in upcoming Layla collections (but that's all I can say about that for now) so I wanted to check it out. Now, normally top coat dulls the holographic finish of polishes. I wanted to test polishes so on my index finger I have Layla Brilliant Due, middle finger - CND Air Dry, ring finger - Seche Vite and pinkie finger - Sephora by OPI top coat. Check this out. The holographic polish is definitely dulled by CND and Sephora by OPI but Seche Vite holds up a bit and Layla obviously looks the best. Here's a comparison of just Layla and Seche Vite. Okay, now for the bad news. 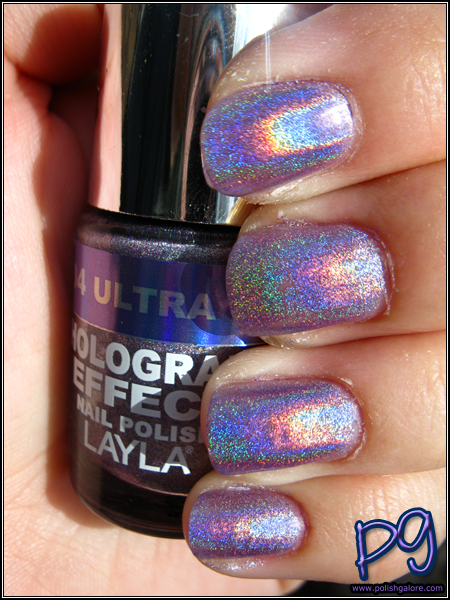 First, Layla Hologram Effect polish won't be available until May. :| At that time it will be available in Ulta and possibly more stores online but Ulta is the only confirmed. The second piece of bad news is that it's a bit pricey at $15.50 for a 10 ml bottle. To compare, Glitter Gal's old bottles were 9 ml for $14.00. a-england is priced at $12.00 for 13 ml. OPI is ~$8 for 15 ml... so yes, it's expensive but it will be available and that's sometimes half the battle. I cannot WAIT to get my hands on more of these. Check this out! Must... have... all... of... them... 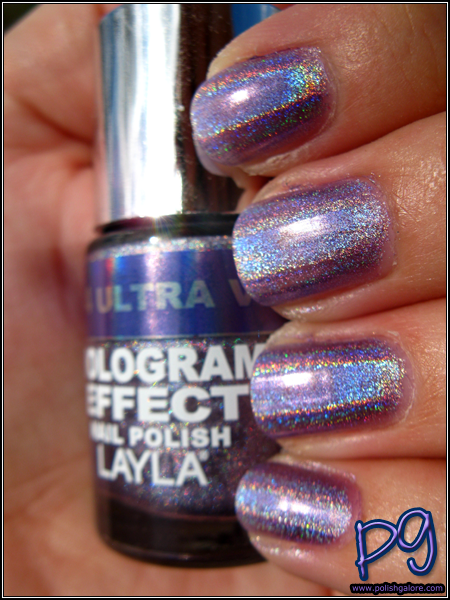 Formula wise, the polish was just slightly thick but not nearly as bad as GOSH Holographic. A tiny bit of thinner would probably make this perfect. Again, this line will be available in May at Ulta for $15.50 a bottle. Layla Cosmetics is distributed to the US through the Luxcon Group who has a Facebook Page to several online websites including Zappos, AVEYOU, Brigette's Boutique, Amazon, and Drugstore. They are gorgeous and so worth the price imho. I've got two, Ocean Rush and Flash Black and love them both. I had no issue with the formula being thick though, only a little weird. I also used a basecoat (nailtek foundation II) and I used a normal transparent polish as a top coat. The holo effect didn't change at all! I totally wish they were just a little bigger! I've been told that aqua bases (like Nfu-Oh Aqua Base) works best as a base coat but I'll just have to check it out! That's great that your top coat didn't dull the polish - so many do! They look like they will be really pretty, and I love my Layla magnetics... but I don't know. I think I'd rather buy Glitter Gal?? Also I prefer to always use a base coat... will these only adhere to buffed nails? GlitterGal is just so hard for me to get since it requires ordering online and US e-tailers don't have all the new bottle sizes, which are also going to be more expensive. I was shocked at how small my GlitterGal Light As A Feather was (review coming soon). I didn't use a base coat in any of the pictures but I did not buff my middle and pinkie fingers and while the polish did "stick", I did have some balding issues. I've been told aqua bases (like Nfu-Oh Aqua Base) works best as a base coat for holos. Of course! I just hope my Ulta gets them or doesn't charge a lot for shipping! I've heard that some people have been able to buy from Layla directly - they are located in Italy. Holy wow.. $15.50, I will still buy some though haha. It's so gorgeous!